Krampus: Get Your Hwt On! As the last degrees of warmth fade from the night air and the light recedes, it is time to prepare for the season of hwt. Throughout nature, animals labor to survive the winter months. While animals struggle against the natural forces of cold and hunger, mankind battles the unnatural forces that thrive during the shorter days and bitter nights. 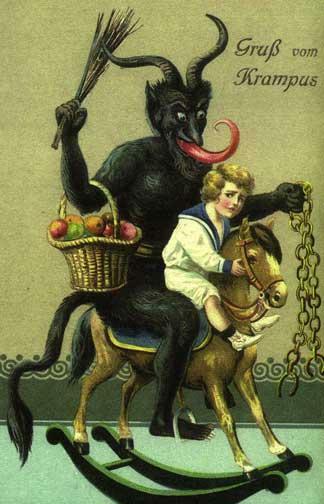 The most famous creature of hwt is called Krampus, by humans. This Alpine, beast-like creature emerges to punish the naughty children of the world. Every year, the Krampus would watch children and wait for the special time of year, when the nights grew cold enough to appear and punish the wicked. Also according to tradition, Krampus is an expert at torture and cruelty. In fact, his torment ranges from simple harassment to gruesome murder and mutilation. NOTE: Krampus has some mischievous cousins, who live farther north, called Jolasveinar. So before you wander off on Krampusnacht (Night of Krampus), the eve of St. Nicholas’ Day, make sure you are wearing your Krampus mask. This may fool some. But, for those who are wise in the ways of HWT will not be fooled. They may call upon Santa’s former partner to teach you a holiday lesson. Or, if you are daring enough, you can try to bribe your way out with a Krampus Card…. good luck! Erich on Krampus: Get Your Hwt On!